Central chest pain possibly spreading to arms neck and jaw? Feeling sick or sweaty or short of breath, as well as central chest pain? Dull pain, ache or heavy feeling in the chest, pain in the chest that can spread to back or stomach, chest pain that feels like a bad case of indigestion, feeling light headed and dizzy together with central chest pain. Many people do not recognise the symptoms of stroke early enough, or know how a simple 2 minute test can help you realise a person may be suffering a stroke. Don't worry if you are not sure. If you are assessed as needing the emergency ambulance, the 111 team will arrange it for you. Please visit the link to the 111 Service below. If the emergency is life-threatening call 999 without delay. You will be asked a series of questions but this will not delay the emergency ambulance. Examples of life-threatening emergencies are:- cardiac arrest, chest pain, breathing difficulties, stroke, severe allergic reaction, severe asthma attack, serious bleeding, choking, unconsciousness. While we hope a medical crisis never happens to you, the fact is that sooner or later something may occur which means you need to call the emergency ambulance via 999. There have been instances where ambulance crews and responders have been delayed in reaching the casualty because the address is particularly hard to locate, especially at night. Residents and visitors to the area can do much to ensure that they can be found quickly in cases of medical emergency. Some things can be done now, before you ever need the emergency services. When you call 999, please give your full address and/or location, including any house name and/or number in the road and the nearest road junction or landmark (near the post box etc.). Some house names can sound like road names, and vice versa, so please make clear which is which when you call. Any extra pieces of information you give can help get you a faster response. It is extremely important to consider whether your house name or number is visible from the road during the day. And what about at night, especially if you live in an area where there is no street lighting or where it is poor? Take a look at the 'Is your number up' article on the right. If the emergency services or responders can't identify your house quickly they will waste precious minutes trying to find you. When you first arrive for your break away, give just a little thought to exactly where you are; the area, the road, the house name or number, the site name, the pitch number and so on. If there is no pitch number, pick out something that would identify your location and memorise it, the nearest washblock etc. Get someone to alert the duty warden, if there is one, so that they can direct the ambulance or Community First Responder when they arrive. When speaking with the ambulance operator on the phone give them some directions which they can pass to the crew as well as any pitch number. For example, "Turn left as you come in, follow the track and we are behind the washblock / at the bottom of the hill / by the stone wall near the lake" etc. All such descriptions may help the emergency services find you quickly if you don't have a clear pitch number or location they can refer to. At night, someone should switch on your car's hazard lights / headlights which will also help attract the attention of those arriving. Try and arrange for someone to meet the ambulance at the site entrance if no warden is present, but DO NOT abandon the patient. Once the emergency operator has put you through to the ambulance service, you will be asked a series of questions. Please try and remain calm and answer the questions where you can. They are being asked for a good reason. Do not hang up until the ambulance operator tells you to and follow any instructions they may give you. If the emergency services are likely to find it hard to locate you, please give some directions to assist them (see Residents and Visitors sections for some useful tips). Someone should stay with the patient at all times, but if there is another person around, ask them to go outside and signal to the Ambulance or Community First Responder. For their own safety, and to signal to the emergency services, they should take a torch if there is no street lighting. This is crucial where the address has only a name, or where it cannot be easily identified from the road. Remember that Community First Responders may arrive in their own private cars. Have any medication used by the patient ready to show the ambulance crew. ALWAYS -Please lock any dog or other animal away in another room or your car or somewhere that it cannot interfere with those due to arrive, regardless of whether you think it is normally "friendly". The animal cannot understand what is happening and may try to defend its owner from unknown people arriving. Ambulance crews and Community First Responders cannot take the risk of being bitten and need to concentrate their attention on the care of the patient. Before any of the emergency services can help you they have to be able to find you. Certainly in Bransgore many roads have very little if any street lighting, and many houses have names instead of numbers. 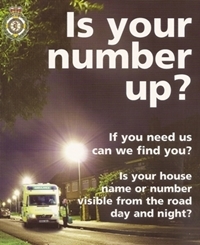 To ensure the emergency services can find you in an emergency, please ensure your house name or number can be seen from the street, day or night. Wasting precious minutes locating a house name or number can mean the difference between life and death. 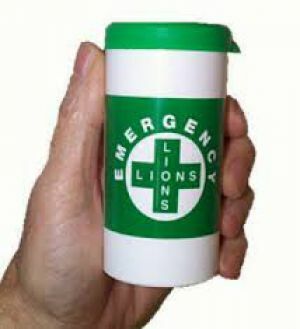 All Emergency Services are aware of the Lions Message in a Bottle scheme, and will locate the bottle and pass it on to a doctor or hospital personnel in an emergency. Bottles are available free from many chemists, doctors surgeries etc.